The Bhagavad Gita: The sole secret of inner peace. Rave Reviews | Free Bhagavad-Gita Downloads | Bhagavad Gita Quotes | About Prof. Kev Nair | Buy NOW! "How to pick up fluency in English thro' self-study..."
to yourself or your friend, absolutely free of cost! There's a great offer inside the Calalogue! The Setting of the Bhagavad Gita (Mahabharata: What led to the Battle of Kuruskshetra). Download these Bhagavad Gita pdf ebooks! FREE! (Click on the e-book to send) Download these Bhagavad Gita pdf ebooks! FREE! The Bhagavad Gita (sometimes referred to as the Bhagwat Gita) is a Sanskrit poem of great antiquity. It teaches you how to live a life of true inner courage. The Bhagavad Gita – “the Song of the Lord” – is one of the world’s most revered of sacred books. It is an inspirational poem composed in Sanskrit. The Bhagavad Gita (the Bhagwat Gita) belongs to the pre-Christian era, and is based on the unchanging truth of the ultimate reality. It speaks about the timeless truths about ourselves and tells us how to realize them – so that we can free ourselves of all our griefs and fears, and live our life with true inner peace, dealing effectively with whatever happens to happen. What is the Bhagavad Gita all about? The Bhagavad Gita is a treatise on every human being’s supreme dharma to go on remaining calm and to do their worldly duties prudently – by defeating the thoughts and events that constantly try to prevent them from doing so. The whole focus of the Bhagavad Gita is on teaching you a single, all-important, lesson: What is important for true joy in life, the Bhagavad Gita teaches, is not that painful events, results or thoughts must not happen – or that only pleasurable events, results or thoughts must happen. What is important, the Bhagavad Gita teaches, is this: No matter how painful or pleasurable the events, results and thoughts that happen appear to be, you must have the courage and determination to stay anchored to this understanding. And you must have the courage and determination, the Bhagavad Gita teaches, to do your lawful duty calmly, holding your mind still, undeterred by them all. The Bhagavad Gita teaches you why this is so, too. And the Bhagavad Gita teaches you how to acquire the knowledge, skill and devotion required to achieve this courage and determination. The Bhagavad Gita presents these teachings in the form of a dialogue that took place on a battlefield between Arjuna, a warrior prince, and Krishna, the Lord of the Universe in human form, acting as Arjuna’s charioteer. Some of the more common alternate spellings by which The Bhagavad Gita is referred to include the following: Bhagavad-Gita (with a dash in between the words), Bagavad Gita, Bhagwat Gita, Bhagawad Gita, Bhagavad Geeta, Bhagavad Geetha, Bhagavath Gita, Bagavat Gita, Bhagavat Gita, Bagavath Gita etc. The Bhagavad Gita is also referred to as the Srimad Bhagavad Gita and Krishna Bhagavad Gita. - 1st Edition. Collector's Edition. - Crown 1/8, Pages 307. - High quality laminated jacket. - Extensively annotated, cross-referenced & indexed. - Available separately in e-book format also. • "This is one of the rare publications on the Bhagavad Gita, wherein the stamp of assiduous research is evident." - THE HINDU. • "Highly acclaimed spiritual classic..." - THE HINDU Business Line. • "The Bhagavad Gita of Inner Courage... Prof. Nair’s work is the first ever translation that presents the Gita in its true wholeness." - Competition Success Review. • "The Bhagavad Gita of Inner Courage... Scholarly and fluid" - THE HINDU Business Line. • "The Bhagavad Gita of Inner Courage... Easy-to-read and easy-to-understand" - The New Indian Express. 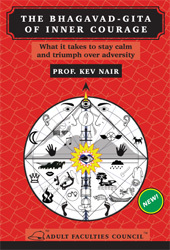 • "The Bhagavad Gita of Inner Courage... Prof. Nair has translated every verse by using simple, straightforward English in such a simple and straightforward way as to make even their hidden meanings clear." - Competition Success Review. • "The Bhagawad Gita of Inner Courage... For the message to be clear while making the language as simple as possible, Nair slogged for years, rewriting and discarding many versions... LAUDABLE EFFORT." - THE HINDU. • "Faithful to the original... The Bhagavad Gita of Inner Courage " - The New Indian Express. • "The Bhagawad Gita of Inner Courage... This work lets you see the Gita as a single whole, rather than as a mixture of several teachings. " - THE HINDU. “The Bhagavad Gita in its true wholeness” is the one phrase that can best describe Prof. Kev Nair’s translation of the Bhagavad Gita into English. The whole focus of the Bhagavad Gita is on teaching you a single, all-important lesson: How to acquire the courage and determination needed to hold your mind still and to go on doing your duty calmly and with absolute devotion. Undeterred by the events, results and thoughts that keep happening. No matter how painful or pleasurable they appear to be. This single, all-important lesson of courage and determination, the Bhagavad Gita teaches, is the key to true joy in life. And the Bhagavad Gita teaches you how to acquire the knowledge , skill and devotion required to achieve this courage and determination. Prof. Kev Nair’s Bhagavad Gita of Inner Courage is the world’s first work that lets you see the Bhagavad Gita as a single whole – unified by this singleness of focus – rather than as a mixture of several teachings. (ii) To transform yourself, your children, employees and others into individuals of great character who cannot be overwhelmed by adversity or pressures of life. The Bhagavad Gita at its clearest! Invaluable translation of the Bhagavad Gita! “An English translation of the Gita which will make it more accessible to the reader... A product of 10 years of the professor’s intense research... All the 700 verses have a consistent metrical scheme. As you read them, the lines develop a swing of their own... Kev Nair... has made every effort to make his Gita suited for reading aloud, to be enjoyed to the fullest... faithful to the original... On the whole, the translation does not force you to see the Gita from a particular angle and then make you think that the partial picture is the complete picture..."
• The Bhagavad Gita's singleness of focus (and the underlying cohesiveness powered by that one-only focus) uncovered for the first time. • Absolutely faithful to the original. • Translation done with single-minded loyalty to the spirit of the original and in an absolutely disciplined and focussed way. • A flood of new light thrown on the Bhagavad Gita’s verses in a way that no other translation has ever done so far. • Never-before-in-print interpretations of key Sanskrit terms in the Bhagavad Gita. • Puzzling and difficult-to-understand verses of the Bhagavad Gita demystified, clearly restated and made easy to understand. • Incredibly easy to understand. • The central core of the English language used throughout — neither the pompous, pretentious kind nor the faddish, short-lived kind, but the ever-alive core. • Noble language, noble tone and noble style used throughout. • Great care and attention given to the choice and arrangement of words in every line. • An atmosphere of profound reverence and respect maintained throughout... for that which is ever present as ‘one whole’ in every one of us and in the universe – and which is what is truly holy. • Backed by Prof. KevNair's lifetime of serious study and learning of the Bhagavad Gita. • Whoever stays intentionally unmoved by dualities is in the state of true self-knowledge, & in the peace & calm it brings. - See Bhagavad Gita, 4.36. Copyright © Kev Nair 2009. For more Bhagavad Gita quotes from Prof. Kev Nair, click here. Spirituality sans superstition. Rationality sans delusion. This website is best viewed in an 800 x 600 resolution setting. All rights reserved worldwide.  Copyright © 2008 Uma V. Nair, Adult Faculties Council, Kochi-26, Kerala, India.